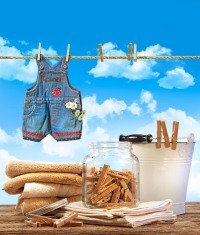 When times get tough, we can go back to our grandparent’s era and “make your own homemade laundry detergent”! It worked then and it will work for you too! All you need to do is make sure you have extra supplies on hand to make them. So put together a list of what you need to store, and you are set to do laundry! Times are getting tougher for many people right now. Save money today and make your own laundry soap today. Note: To keep the liquid detergent stirred up, put a few marbles in the storage jug. When you shake the container, the marbles will help mix everything and keep it mixed. You can use an empty laundry jug for your homemade soap. Put grated Fels Naptha in saucepan and cover with water. Heat on low until dissolved. Fill bucket with hot water and add soap. Stir to combine. Add 1-cup washing soda and 1 cup borax and mix well. As it cools, it will thicken. If mixture becomes too thick, add hot water to thin it to desired consistency. May be used immediately. Mix well before each use. Use 1/2(normal) to 1 cup per load (heavy). Cost per load .04. To make a large batch - grate 6 bars of Fels Naptha Soap and then add 3 cups of Washing Soda and 3 cups of 20 Mule Team Borax. Mix well and store in covered container. Tips: The above recipes will NOT make suds in your washer so don't be alarmed. Fels Naptha Soap is a pure soap and typically makes little or no suds in the water. This makes it perfect for use in the new HE washers as well as traditional washers. You will also notice the need to either reduce your laundry softener or in most cases you can even eliminate the use of softener completely. Spray onto stains and let it soak for a minute or two before you toss into the washer.